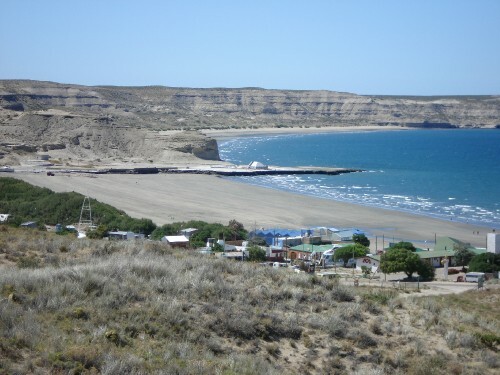 Blog from Puerto Madryn, Argentina | Gemma goes global! Arrived in Puerto Madryn safe and sound, on what has to be the most amazing bus ive seen! Massive leather reclining seats, flat screen TV, blankets and pillows and 3 meals! I love these Argy buses! 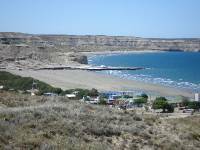 Anyway enough about th bus . . . . Puerto Madryn is lovely and quiant, nice to be back in a small town again. The main features to do here are the wildlife out on Peninsula Valdes. Rumoured to not have much of a night life here, we were quite surprised when we were out for a quite drink the other night. Walked into the local bar, possibly the only one, and was taken back about the amount of red decorations and romantic ambience. Ignoring this we order the necessary Mojito´s and found our quite spot. Not so quiet when we appeared to be situated next to some form of ´stag´party, shortly followed by what only can be described as flamengo dancers in very bright pink outfits shaking their what they´ve got all over the place! This is when things changed . . . . .Out come the next dancers, this time respectable tango dancers, so amazing, everyone out here can tango! Each time the performance ended we thought that was all, but oh no, how wrong were we. At this point we have a quick scan for escape routes, but there are none. The another set of scantly clad women come out, each time wearing smaller outfits. Then two Argentinian girls, dressed as American gansters in da hood, try some hip hop dancing, they should really stick to the tango! Then to top it all off out comes a a solo dancing women, in a ra ra skirt and bikini, which dont stay on for long, and tries out a bit of pole dancing on the bar. Definately time to leg it . . .
After that amusing night we met up with two other girls from hostel to do a car share to drive ve to Peninsula Valdes, to see whales and peguins. Long way, about 400km rundtrip, nt always on roads either, nothing changes! First get to the town of Piramides, with a whooping 300 person population, to catch a boat to see the whales. After seeing some sea lions hanging out on route, we start whale spotting. Soon after they appear, all 15 tonnes for the adults an 7 for the baby´s! 4 in total were swimming round the boat, they were so close. Not the most attractive things in the world, but absolutely awesome creatures. The baby ones a bit more curious than the mothers of us gringos! Then afterwards went back to the town to get the car to drive across to the far side of the island and see peguins. These were much closer as they just hang out and woddle around the beach making funny noises. Then a bit further down is the only place in the world to see elephant seals, but the little w***s werent there, just other sea lions, also making some very unattractive noises.